Of all athletic feats, the vertical jump seems to capture the imagination the most. 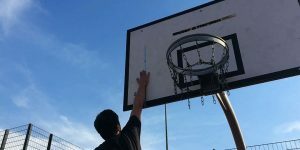 Everybody who plays basketball wants to be able to dunk. We can watch endless highlight reels of dunks without getting bored and we love brutal weak side blocks that come out of nowhere. But, who is the athlete with the highest vertical jump ever? And, do NBA players jump higher than NFL players or even Track and Field stars? Let’s find out. 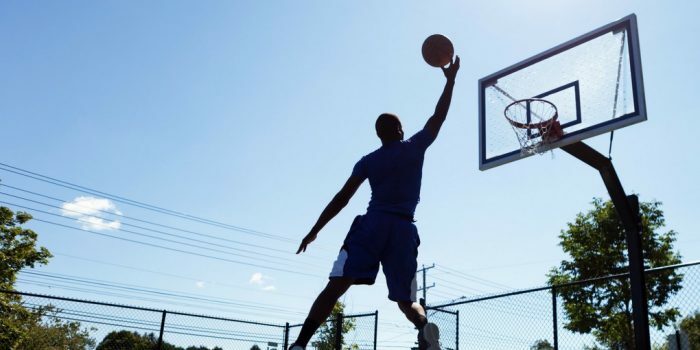 Basketball is a game dominated by tall, athletic players and being able to jump high offers serious advantages when it comes to attacking the rim and securing rebounds. No wonder that some of the best leapers of all time come from the NBA. Every summer, the most intriguing prospects of the NBA participate in the draft combine where officials not only measure the height and wingspan of the players but also watch them perform different tests of athleticism like agility drills, lifting weights and vertical jumping. These vertical jump tests are performed either from a standstill (no step-vert) or with a run up (maximum vert). The most impressive vertical jump ever measured at the draft combine is from DJ Stephens who posted a 40 inch no step vert and an amazing 46 inch max vert. That guy has some serious bounce. Other noteworthy players with great combine measurements: Nate Robinson (43.5″), Vince Carter (43″) and Muggsy Bogues (44.3″). You can check out the complete combine results here. Unfortunately, these results from the Draft Combine don’t really tell the complete truth because a lot of future star players don’t show up knowing they are already in the lottery. There are a lot of NBA players who are regular guests on the daily TOP 10 highlights because of their gravity-defying dunks. A lot of historic greats had amazing leaping power. Unfortunately, it is hard to tell the true vertical jump of these players because they were never properly tested. Despite the lack of accuracy, the videos are incredible to watch. Wilt Chamberlain was a man among boys. 7’1″ tall with a wingspan of 7’8″, he dominated the NBA and still holds many unbroken records to this day. He is the only NBA player ever to score 100 points in a single game and his 50.4 ppg average in 1962 will not be broken any time soon. It is very hard to measure his vertical jump retroactively, but check out this footage. He looks as if he could grab the top of the board if he wanted. If you are nicknamed “His Airness,” you better be able to sky. And, Michael Jordan certainly didn’t disappoint when it came to acrobatic dunks and incredible hangtime. Michael Jordan’s vertical jump was officially measured at North Carolina during his time at college. 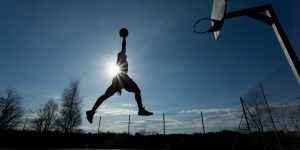 There, he reached a maximum running jump of almost 46 inches and also showed a 42″ vertical or one-handed dunks. Maybe the best dunker of all time, Carter impressed not only with his incredible vertical, but also an effortless style, which made even hard dunks look incredibly easy. He also has the perhaps most famous dunk of all time when he jumped over french 7-foot-2 center Frédéric Weis in the 2000 Olympics. The vertical jump test is a regular part of the NFL combine because of it’s great ability to measure lower body power. Interestingly, NFL players regularly outperform NBA players in the standing vertical jump test. This is due to the fact the test depends a lot more on strength than does a running jump and NFL players are usually stronger than NBA players because of the different requirements of their sports. The record vertical jump test at the NFL combine is still held by Gerald Sensabaugh who achieved an incredible height of 46″ at the 2005 Combine. Compare that to running vertical jumps of high-fliers like Zach LaVine – truly astonishing! The world record holder for the high jump is Javier Sotomayor who is the only human ever to clear 8ft with a jump height of 2.45m (8ft 1/4in) in 1993. Jumping over a bar at 96 inches is certainly impressive! 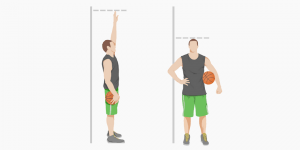 But, how does it compare to a vertical jump in a basketball game? Compared to a dunk, the high jump relies much more on technique. You need to jump high, and you also need to have great timing and body control to cross the bar at the exact peak of the jump. In addition, the Fosbury Flop technique helps athlete clear a bar even though their center of gravity is actually lower than the bar. This is achieved by arching the back and kicking the legs once the bar is crossed. If we assume Sotomayor’s center of gravity is at 1.10m (he is 1.95m tall and has very long legs) and he can clear the bar with his center of gravity 10cm below the bar, he would still have a vertical jump of 1.25m or 49 inches. The box jump is a very popular vertical jump exercise in which the athlete tries to jump on top of a box either from a standstill or with a run-up. The way to reach dizzy heights here is not only to jump high, but also to be able to tuck your legs as high as possible at the end of the jump to make the top of the box. As you can see, there are many athletes from different sports out there possessing incredible vertical jumps. And, I am sure I missed a ton. 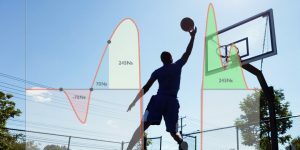 But, one thing is for sure: the vertical jump is one of the most useful athletic tools available and will help in almost any sport you can imagine from basketball, volleyball to football and even soccer. You want to increase your athleticism and vertical jump too?